Every business should have one or more fire extinguishers in place to protect their employees and their assets from fire. To put out a fire, the extinguishers need to work when needed. To ensure proper operation in an emergency, fire extinguishers need to be routinely inspected. In fact, regulations require frequent inspections for just this reason. 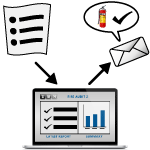 SBN’s fire extinguisher inspection software can help an organization ensure its fire extinguishers are inspected on time. 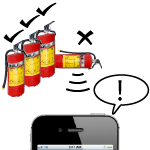 SBN’s fire extinguisher inspection software uses a fire extinguisher inspection checklist to document inspection of each fire extinguisher in an establishment. Deficiencies can be noted and the appropriate stakeholder immediately notified to fix the deficiency. Email reminders about pending inspections will automatically be sent, and Program Managers can use the SBN’s administrator tool to see in real-time how inspections are progressing. The fire extinguisher inspection checklist is one of many pre-defined checklists available in SBN’s library. We offer many inspection checklist apps from fire extinguishers to forklifts all available through our mobile inspection software platform. Using our powerful mobile inspection software, leverage the power of mobile devices to conduct inspections on a large scale. Inspections can capture not only text but also rich media and potentially submit the data in real-time. Safeguard inspection data collected on mobile devices by storing it in the cloud. This will ensure that other applications in the company infrastructure can also potentially use the inspection data, thus enabling tight integration of internal company services. Our inspection management software enables company administrators to view collected data and apply corrections or trigger actions as necessary. Integrated inspection report functionality allows administrators to escalate or deliver data as needed. Click on one below for more details. For a customized solution, please contact us for more information. Simple But Needed enhances critical elements of your operations by leveraging mobile and web technologies to perform key activities such as tracking assets, performing inspections, and completing other safety and compliance requirements. Our solutions reduce risk, save time, and easily configure to meet existing operational needs. Transform your computers, phones, and tablets into powerful tools. Save time. Do more. Keep it Simple. Copyright © 2019 Simple But Needed, Inc.